The latest Apple mobile operation system - iOS 12 - will be available in the next couple weeks and it is no surprise that millions of users have joined the iOS 12 public beta program. Whether you have problems with upgrade your iPhone/iPod to iOS 12 beta, or you simply update your device to reliable iOS 11.4, at times you may have met some kinds of iOS 11/iOS 12 upgrade failure issues. So we tested a series of iOS/iPhone fixer utilities and rounded up this Top 5 Best (even free) iOS System Recovery software list for walking you through all kinds of iOS 12 update problems (Learn How To Get An iPhone Out of Recovery Mode Without Computer). Fix My iPhone is the best iOS System Recovery software for computers running macOS. It works in 99 percent of the iOS update failure scenarios during our tests and earned perfect or near-perfect scores in other test lab results. It's Smart iOS detective engine can automatically find all abnormal situations on your iOS 12 update progress and even off er you the ability of downgrading your iPhone from iOS 12 to iOS 11. Get An iPhone Out of Recovery Mode Without Computer: Quit a bricked iPhone to normal mode in one click. Fix iPad Stuck in Recovery Mode Problems: Whether you're using iPad Air, Pro or iPad mini, Fix My iPhone can fix a variety of iPad stuck in recovery mode problems for you. Fix iPhone 6/7/8 Battery Draining Fast: customized solution for iPhone 6s device unexpectedly shuts down and severe battery draining all at a sudden issue. Fix iPhone Stuck in Recovery Mode Won't Restore: You've installed an iOS update but your iPhone gets stuck in a continuous restart loop. And here is the fix. 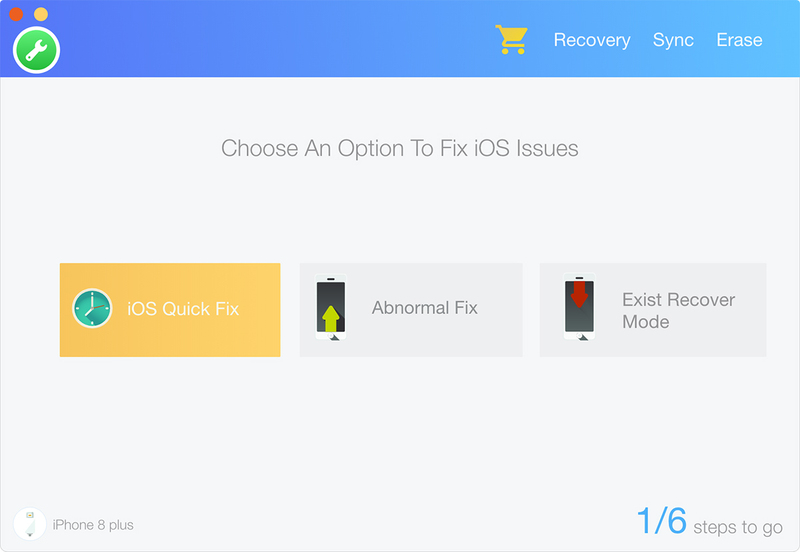 According to TenorShare, ReiBoot not only helps users get iPhone out of recovery mode and fix common stuck issues, but also downgrade iPhone software to iOS 11/iOS 10, fix Apple TV problem and other 50 + iPhone software issues. 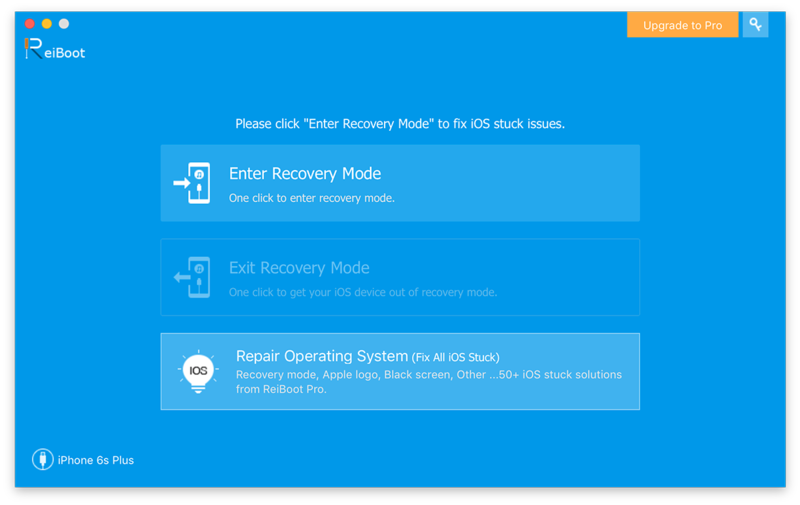 The reason of nominating ReiBoot as the second best iOS System Recovery software is for its simple and intuitive design. You can handle with all its amazing iOS crash fixing features without reading any documents (What's The Best iPhone Data Recovery Software in 2018). 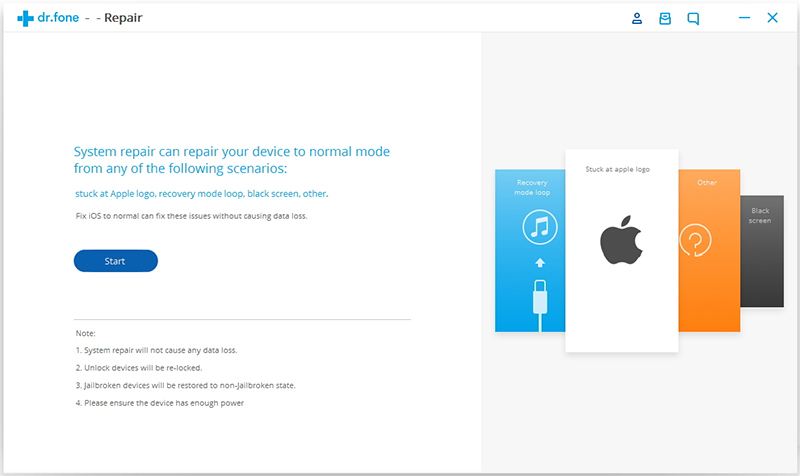 Enter/Exit Recovery Mode: One click to Enter/Exits iPhone recovery mode when the device gets stuck, no data loss. Fix iPhone Stuck on Apple logo: Download and install the latest firmware package to fix Apple logo stuck. Fix iPhone Black Screen: Repair iOS system to fix iPhone black screen issue without losing data. Fix iTunes Update/Restore Errors: Fix many iTunes errors during updating or restoring, no need to uninstall. iMyFone iOS System Recovery is another iOS System Recovery/Repair software that we like in 2018. One shortcoming of iMyFone iOS System Recovery is its limit on your final iOS recovery step in the free trial version. However, you can still download it to test if it is compatible with your computer and iOS devices, and to experience the process before fixing (Learn How To Recover Permanently Deleted Photos on iPhone 6). Standard iOS System Recovery Mode: Fix the iOS problems such as iPhone stuck or frozen without causing any data loss on your iOS devices. 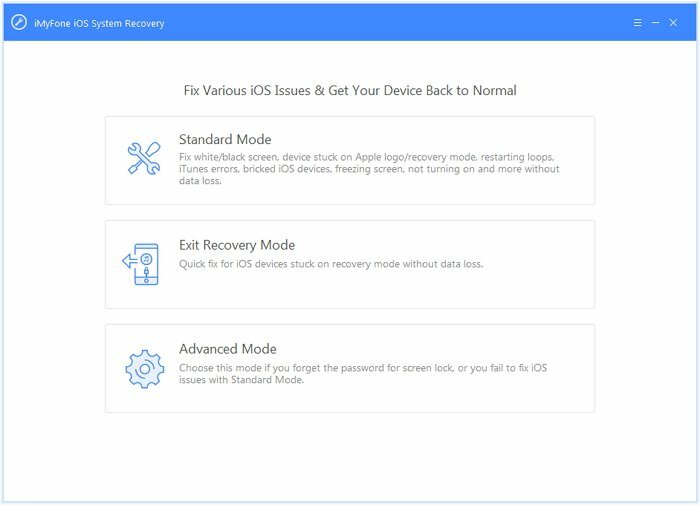 Quick Method To Exit Recovery Mode: One-click quick fix for iPhone/iPad/iPod touch stuck in recovery mode without affecting the data on the device. Advanced iOS System Recovery Mode: Enable a disabled device and fix the serious iOS problems that the other 2 modes can't fix. All data will be lost. When your iPhone or iPad stuck in recovery mode or white Apple logo, or other iOS 11/12 software problems like that, dr.fone - Repair gives you another iOS System Recovery solution along with restoring your iPhone from iTunes. With dr.fone, Repair, you can easily fix many kinds of iOS system update failures and get your iPhone back to normal with few clicks. Mostly importantly, you can handle it by yourself within less than 10 minutes, and won't lose any data. Fix iOS to Normal: You can fix your iOS issues by yourself, instead of sending it to repair stores with a bunch of money and at the risk of your privacy. Recover iOS System from Various Situations: Fix your iOS to normal from black screen, recovery mode, white screen of death and more. iOS System Recovery is a popular feature in FoneLab for iOS, a superb iPhone data recovery software made to recover corrupted iOS System of iPhone/iPad/iPod easily. To use FoneLab's iOS System Recovery, you simply need to connect your iPhone to your Mac, and this software will detect your device if it needs to be repaired. And follow a few easy steps, you can get your iPhone out of the iOS 11/iOS 12 software problems you’ve met. 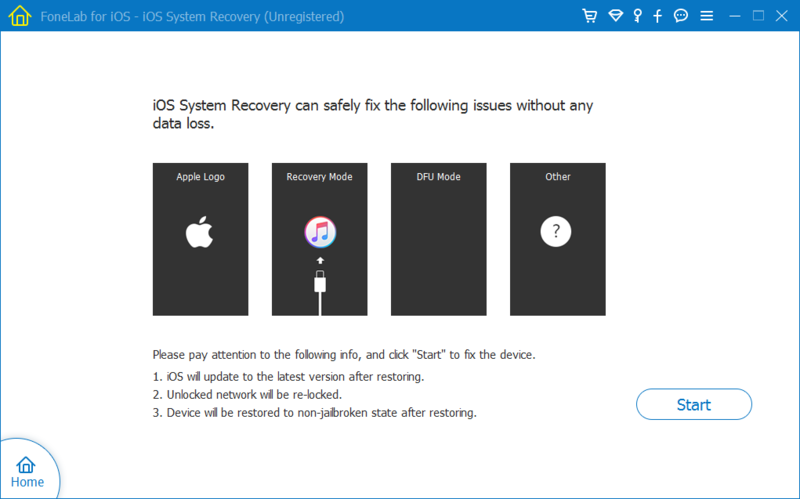 Have you get your best iOS System Recovery software from our Top 5 list above? If you have better options, or want to send any feedback, feel free to drop a line to us via the comment box below.